On 11 March Immigration introduced a number of new occupation lists affecting General Skilled and Employer-sponsored migration. This update follows a review and consultation period with the Department of Jobs and Small Business, to ensure that ‘the entry of skilled foreign workers to Australia remains carefully calibrated to Australia’s needs’. There is great news for the sciences, as a number of occupations in this area have been added to the Medium and Long Term Skills Shortage List (MLTSSL). This makes skilled independent migration possible for Life Scientists, Biotechnologists, Environmental Research Scientists, and Microbiologists. 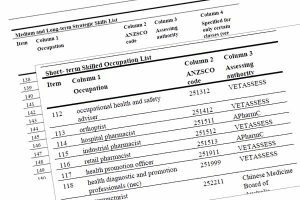 The Short-Term Skilled Occupation List (STSOL) has seen a number of changes, with 27 occupations removed; though most have gone to the Regional Occupation List (ROL). Please note there are different occupation lists for Skilled Migration and Employer Sponsored migration – even though they have the same names. It is critical to ensure that you are looking at the correct occupation list for your chosen visa type.